ranges and battery endurance.What's more, it can read barcodes at extreme angles. on the manufacturing production line or your warehouse, the Inateck BCST-60 will be a great fit for your specific needs. 5,000 barcodes can be memorized and the number of barcodes can be counted. 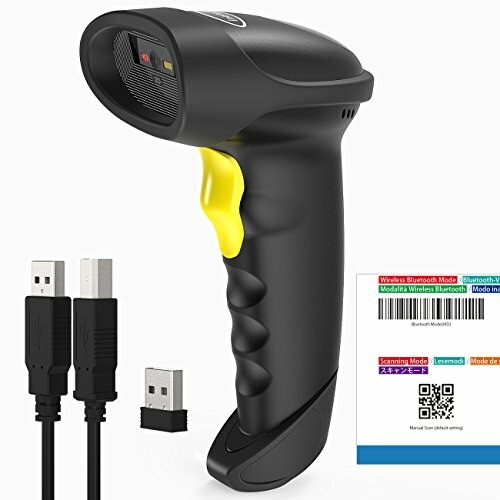 1D&2D Barcode Scanner: The scanner can quickly read various kinds of 1D and 2D barcodes, including QR, Data Matrix, PDF417, UPC/EAN, Code 128, etc. Screen Barcode Supported: BCST-50 features the function of collecting digital image, which makes it capable of reading barcodes on your phone and laptop screen. A great convenience for mobile payment at stores and supermarkets. Bluetooth & 2.4G Wired Connection: The scanner is compatible with different kinds of devices. You can connect it with your phone and tablet via Bluetooth. And you can also connect to a non-Bluetooth computer by the 2.4Ghz adapter that comes with the package. Three Modes: The scanner features two different modes, touch-activation, auto-sensing, as well as inventory mode for off-line data storage. It has 2M internal memory, roughly the size of 50,000 24-digit barcodes. Prolonged Battery Life: With a 2000mAh battery, the scanner can be used for 15 consecutive days under Bluetooth connection, and for 30 days under 2.4Ghz connection, three times longer than other counterparts.